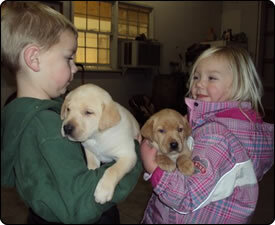 Welcome to Sly Fox Farm Labradors! We are a small, family owned and operated lab breeder located in Centreville on the eastern shore of Maryland. We breed AKC Labrador retrievers for hunting, service work, and pets in family homes. All of our Labrador retriever puppies are raised in our home and are an integral part of our family. We hunt with our dogs, compete with them in AKC Hunt Tests, and travel up and down the east coast jumping in DockDog competitions. Labs are a gentle, intelligent, family friendly, and calm breed, and about 70% of our lab puppies go to families. All of our labs are AKC registered, and we also offer a 26 month guarantee on our Labrador retriever puppies. Feel free to browse pictures of the labs and retrievers that we breed. If you would like information about available litters, call us at 410-490-5885, or send us an email at slyfoxlabs@verizon.net.